This little apron has been designed to help your little one learn measurements, enjoy cooking, save recipes. 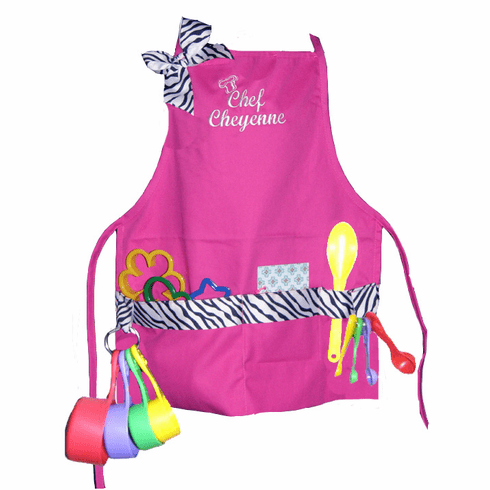 Apron includes: Pocketed Apron, Personalization, Ribbon Decoration, Bows (if applicable). 3 Plastic Cookie Cutters, 1 Small approx. 2", 1 Medium approx. 4", 1 Large approx. 5"- designs will vary 8-1/2 inch White Plastic Mixing Spoon, 5" x 3" 10 Page Flip Recipe Card Keeper - designs will vary Full 4 Piece Colorful Accents Set of Measuring Spoons, 1 tlbs, 1 tsp, 1/2 tsp, 1/4 tsp Full 4 Piece Colorful Accents Set of Measuring Cups, 1/4 cup, 1/3 cup, 1/2 cup, 1 cup. Apron with divided pocket, 16.25"x18.5" with biased edges, 7 oz. poly/cotton twill. Construction: All raw edges bias or turned. Bias (.5in.) ties and neck. Sewn with heavyweight thread. Our products are tested according to standards established by the CPSC, ASTM, and other state and federal agencies. ASTM standards include tests for cadmium, lead and other metals. Hat... 1.5" wide headband with elastic in the back for adjustability The set is sized to fit most 3 to 8 year olds. This item is not recommended for children under three years old.